The Manitoba Association of Women’s Shelters (MAWS) is excited to announce a fun and unique opportunity for salons across Manitoba to make a difference in their communities and help to end violence against women and children. 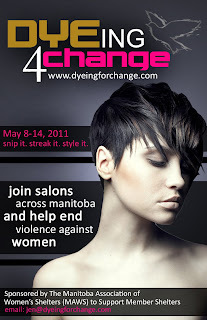 DYEing 4 Change aims to eliminate violence by mobilizing salon professionals and others to fight the epidemic of domestic abuse. DYEing for Change will take place from May 8-14, 2011 and will serve as an opportunity for salons to register to receive an educational package about domestic abuse and/or register as a DYEing 4 Change Fundraising Salon.